The modern housecat evolved from the African wildcat (Felis sylvestris lybica), which is evident in the fact that the African wildcat’s DNA is indistinguishable from that of a modern domestic cat. The European wildcat, by contrast, shows more genetic divergence from its domestic counterpart. Dogs and farm animals such as chickens, ducks, and sheep lived with humans as far back as the Mesolithic Age (Middle Stone Age), whereas cats were domesticated far later. It is thought that populations of African wildcats first began to live near human settlements in the Fertile Crescent, which would have likely been encouraged, given their propensity to kill the rodents that feasted on human food stores. This close association enabled cats to grow more comfortable with humans, particularly the sympathetic ones that fed them and cared for young kittens during the most sensitive period of feline social development, which occurs between 2 and 8 weeks of age. As a result of this early handling, many kittens would have come to see humans as not only beneficent creatures, but also as surrogate parents. Appreciation of the cat’s rodent-killing abilities evolved into a reverence for and even worship of felines in Egypt, which reached its height at approximately 400 BC. Egypt’s mother goddess, Bast, with a feline head and a woman’s body, was the symbol for motherhood, fertility, beauty, and grace. Ancient Egyptians mourned when a cat died, and anyone who killed a cat for non-religious reasons was put to death. However, a number of cats were ritually sacrificed and mummified during this period. So great was their love of cats that the Egyptians even lost a war to the Persians to avoid harming a single feline. When it looked as though they would be defeated, the Persian army took advantage of the Egyptian worship of cats by rounding up a large number of them and releasing them onto the battlefield. The Egyptians surrendered rather than risking harm to the revered felines. 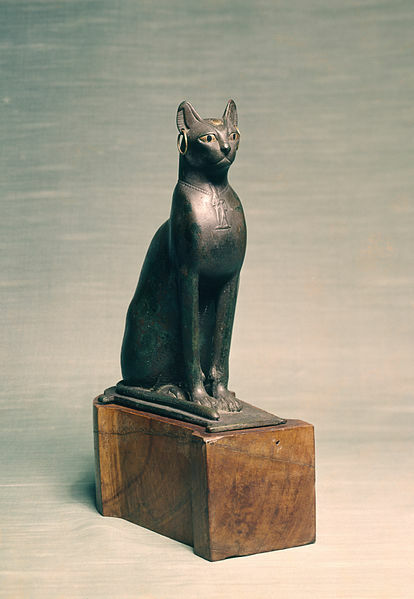 6000 BC–200 BC – Cats were domesticated and some travelled to Rome via trading ships. 200 BC–1400 AD – Cats spread throughout Asia and Europe as the Roman empire expanded, the silk trade flourished, and the Buddhist and Christian missionary movements spread. 1400 AD–present – Cats were brought on ships to kill the rodents that would otherwise decimate sailors’ food stores. These ships travelled to other continents, depositing cats in new places. Being adaptable and comfortable with people, cats became a fixture in many human households, and under human protection, they soon lost their need for camouflage. More ostentatious new patterns and colours no longer hurt a cat’s chances of survival by making it more visible to predators and prey, and humans began selecting for their own standards of beauty, establishing many new cat breeds. In addition, many single women kept cats for companionship, and because such women were often targets for witchcraft accusations, their cats were caught up in the hysteria and executed along with them. This slaughter of innocents carried on until large numbers of people had been murdered and the cat population in Europe decimated. With few cats to curtail it, the rodent population exploded, and with it, the population of plague-carrying fleas. While not the only factor in the plague’s rapid spread, the killing of cats certainly contributed to the human death toll. Although a number of superstitions regarding cats persist from prior eras when they were considered either lucky or demonic, in modern times, cats are usually thought of as household companions rather than shapers of fortune or the embodiment of evil spirits. In recent years, they have surpassed dogs in popularity, based on numbers kept as pets, and they have also been largely relieved of their duties as mousers. Instead, owners discourage predatory behaviour with bells on collars and purchase gourmet tinned foods and kibble for their beloved pets. Once valued for their ability to protect human food from rodent infestation, today cats, like dogs, are valued as nonjudgmental companions that amuse their owners with funny antics and provide unconditional love. Recent research has shown that pet ownership reduces the risk of developing physical and mental illnesses, and so cats are once again earning their keep, albeit in a far less obvious way. For more feline history, see the Cat History page. For a full list of cat articles, see the main Cats page. McClatchy Newspapers. (27 February 2008). “Study Finds Health Benefits to Owning Cats.” DallasNews.com. Neville, Peter, & Bessant, Claire. (1997). The Perfect Kitten: How to Raise a Problem-Free Cat. Octopus Publishing Group, Ltd.